for AgCl, AgBr, and AgI will be calculated. The primary measurement in electrochemistry is the voltage (V) of an electrochemical cell. The voltage describes the relative energies of electrons on different atoms and/or ions. The energy difference, or potential difference, between two electrons is measured in volts (joules/coulomb). The electrons may be on two ends of a wire, on two atoms, or on the cathode and anode of a battery having a potential difference. An oxidation-reduction or redox reaction is a chemical reaction in which one or more electrons from one molecule or atom are transferred to another. Thermodynamics can predict if electrons would prefer to be transferred from one species to another based on the free energy change of the system. For example, electrons are more stable on copper than zinc, so if a piece of zinc is placed in a copper ion solution, the electrons will spontaneously transfer from Zn to Cu2+, where they are more stable. It is possible for a redox reaction to occur in such a way that the electrons cannot jump directly from one particle to another. Instead, the electrons are forced to flow through an external electrical circuit. This type of device is called a voltaic cell. Consider the zinc-copper cell shown below. Zn atoms spontaneously give up 2 electrons and enter the solution as Zn2+ ions. The electrons flow through the external circuit into the Cu electrode. At the surface of the electrode, Cu2+ ions pick up the electrons and are reduced to Cu atoms. There is a 'push' on the electrons from the Zn side of the cell to the Cu side. A salt bridge keeps charges from accumulating on one side or the other, thus maintaining charge neutrality. If the external circuit is open so electrons cannot flow freely through it, electrons pile up on the left-hand side of the broken circuit and are depleted on the right-hand side, which results in the potential difference or cell potential (measured in volts). The cell voltage is proportional to ΔG, the change in Gibbs free energy. The ΔG of the reaction could be harnessed to do useful electrical work. The value of ΔG is given by this thermodynamic equation. ΔG° is the change in Gibbs free energy for the process when all the reactants and products are in their standard states. For gases, the standard state is the pure gas at 1 atm pressure; for ions in solution, 1 mol/L (1 M). The standard state of solids and liquid solvents are the pure solids or liquids. Q is the reaction quotient for the reaction. Q has the same form as the equilibrium constant, K, but the concentrations and/or gas pressures in Q are the instantaneous values in the non-equilibrium reaction vessel, rather than a set of values that characterize equilibrium. 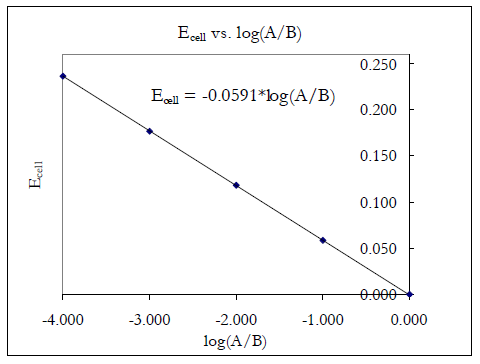 The relationship between cell voltage, E, and ΔG for the cell reaction is given by the following equation. The nF term is related to the coulombs of negative charge transferred in the balanced redox reaction. The number of moles of electrons transferred is given by n. F is Faraday's constant, which is the total charge (in coulombs) of a mole of electrons. (RT / nF × ln Q). 2.303 log10 x = loge x = ln x). The value 0.0591 is the same for all cells at 25°C. E° is also related to the electron energy differences of the oxidation and reduction reaction. results in the equation below. Here, Keq is the equilibrium constant for the reaction as written. Keq can be determined directly from a measured E° under standard conditions. Please use small volumes of solution to reduce the cost of buying chemicals and the problems with waste disposal. Dispose of all waste as instructed. Waste solutions must be segregated according to type. Read the labels on the waste bottles carefully. Clean up all spills. DO NOT THROW ELECTRODES AWAY. Please return them CLEAN. Please dispose of the used vials and salt bridges in the solid waste container in the back hood. Wash your hands thoroughly and carefully when done. If you do not dispose of waste correctly, you may lose points. the Nernst equation is shown below. The metal ion solutions are 0.10 M. Because the concentrations of both solutions are equal (0.10 M), Q will be 1, log Q will be 0, and the measured E will equal E°. The value of n is two because A loses 2 electrons and B gains two as written in the redox reaction. You are experimentally finding the relative 'push' on electrons from one species to another. Fill two vials about 2/3 full of the solutions you will use, labeling each one before you fill it. Dry the outside of the vials if needed. Use only the dropper provided for filling your vials. Put the two vials on the base of a ring stand, side by side in the jaws of a utility clamp, so they are held together. The two liquid levels should be exactly the same to prevent siphoning of liquid from the higher level vessel into the lower. Arrange the vials in the clamp to level them if they are slightly different. Use a strip of filter paper as instructed by your TA. Holding the paper in tweezers, soak it in a small beaker containing 1.0 M KNO3. Gently blot the strip on a Chem-Wipe. You don't want the concentrations of your solutions to be contaminated by solution from the salt bridge. Put one end of the strip into the solution in one vial and the other end in the solution in the other vial. Do not let the tweezers touch the liquid in either vial. Clip one Cu wire electrode to one lead of the voltmeter; clip the other to other lead of the voltmeter. Insert the electrodes into the solution of their own ion carefully so they do not touch the salt bridge above the surface of the solution. You can use the electrodes to push the filter paper strip out of the way. Measure the voltage difference and the cell polarity with the digital voltmeter. Read the voltmeter to 3 figures but assign uncertainty based on the apparent reproducibility of readings. Test Cu with each of different metals provided. Compare your calculated theoretical E° values with your measured values. Find the percent error to three significant figures. In part 1 you measured E° values. In part 2, you will read about how E depends on concentration of ions in a concentration cell. In a concentration cell, both electrodes are made of the same metal and the solutions in the cells are of the same ion as the electrodes. The difference between the cells lies in the metal ion concentration. In this case, the chemical reaction is given below. E° is zero for a concentration cell because the half reactions are identical in both directions. The Nernst equation becomes the following. The spontaneous direction for the reaction is from left to right when Ag+conc (c1) is greater than Ag+dil (c2). In cell 1, ions accept electrons from the metal, plate out on the electrode, and lower the concentration of the ions. In cell 2, atoms in the metal leave electrons behind and enter the solution, thus raising the ion concentration. The reaction occurs in such a direction as to equalize the concentrations of the two solutions. Your data table from this part should have columns for E, c2, and c1. Label six vials as follows: two of 10–1 M, and one each of 10–2, 10–3, 10–4, and 10–5 M. There are Ag+ solutions with which to fill these vials, 2/3 full as before. Use two Ag wire electrodes. Set up concentration cells in which c1 is 10–1 M.
Use all five of the other solutions for c2. Measure each voltage and polarity. Measure the temperature of the lab to determine if this might cause error due to temperature difference from 25°C (assumed in calculation of slope). Also, the temperature is needed in part 3 for the calculation of ΔG of solubility from Ksp. Add another column in your data table for log (c2/c1). , prepare a plot of voltage E against log (c2/c1). Fit the best straight line to your data points. Determine the slope of the best fit line. The concentration dependence of the voltage (the slope) is used in part 3 to determine the Ag+ concentration in saturated AgX(s) solutions. And, part 2 can be considered a calibration for part 3 because the experimental Nernst slope found in part 2 may be used in determining Ksp values. Depending on the lab schedule, part 2 might be omitted. Your TA will inform you in lab. If part 2 is not performed, use the plot that would be obtained ideally (theoretical) from plotting E vs. log([Ag+dil]/[Ag+conc]). Theoretical slope = –0.0591 V.
Put KCl solution into one of your vials and 0.10 M Ag+ in the other. To the vial containing KCl add 1 drop of 0.10 M AgNO3. You should observe the formation of a small amount of the white precipitate AgCl. If you don't, add another drop. The fact that solid AgCl precipitated in your vial means that AgCl(s) is in equilibrium with Ag+ and Cl– ions, so the solubility product condition is satisfied in your vial: Ksp = [Ag+][Cl–]. Clamp the vials together and insert the salt bridge. Since this is a concentration cell, use silver electrodes in both vials. Measure the voltage and polarity of this cell. Do the same experiment with KBr to study the solubility of AgBr. Use KI to study the solubility of AgI. Waste Disposal: Dispose of all waste as instructed. Clean up your work area. Wash your hands. You have obtained enough information to determine the value of Ksp. The same applies to [Br–] or [I–] for AgBr or AgI. Ksp for the three silver halides are [Ag+]dil[Cl–] or [Ag+]dil[Br–] or [Ag+]dil[I–]. : [Ag+]conc is assumed to be 0.10 M (relatively unchanged from its initial value). E is the measured cell potiention in volts. Calculate all three values of Ksp to two significant figures. Compare the experimental values of Ksp with the literature values. to determine your ΔG°. The measured voltage is due to using a 0.10 M reference cell of silver and would have been different if you used another concentration. Therefore it cannot be a measure of the solubility of AgX(s). Complete your lab summary or write a report (as instructed). Part 1: Does Emeasured agree with Epredicted for the various metals? Part 2: Does the slope agree with the slope predicted by the Nernst equation? Even though cell potentials are affected by both concentration differences and voltage differences between different metals, you were able to determine the dependence on each factor (RT / nF and E1/2°). How were the individual dependencies separated out and determined individually? Part 3: How does part 3 depend on part 2?